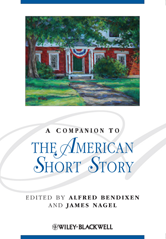 A Companion to the American Short Story traces the development of this versatile literary genre over the past 200 years. Sets the short story in context, paying attention to the interaction of cultural forces and aesthetic principles. Contributes to the ongoing redefinition of the American canon, with close attention to the achievements of women writers as well as such important genres as the ghost story and detective fiction. Embraces diverse traditions including African-American, Jewish-American, Latino, Native-American, and regional short story writing. Includes a section focused on specific authors and texts, from Edgar Allen Poe to John Updike.